Britain is to join the US and three other countries in pushing for a full international inquiry into alleged war crimes in Sri Lanka after the government there failed to satisfy international calls for a such an inquiry, Downing Street announced on Sunday. Speaking last November at the Commonwealth heads of government meeting in Colombo, David Cameron gave Sri Lanka four months to conduct “a credible, thorough inquiry” into crimes alleged to have been committed during Sri Lanka’s 26-year civil war. The prime minister’s office said on Sunday that Sri Lanka had failed to do so and the UK had joined four other countries in tabling a motion at the UN human rights council. It supports the call by the UN high commissioner for human rights for an international, independent investigation into violations of human rights and related crimes by both sides during the war. A vote on resolution will take place at the end of this month. 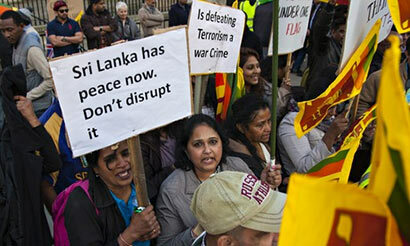 Sri Lanka in the past has refused to allow the UN unrestricted access to former war zones. The Sri Lankan army crushed Tamil Tiger separatists in the final battle of a long civil war in 2009, in a strategy partly drawn up by President Mahinda Rajapaksa’s brother, the defence secretary, Gotabaya Rajapaksa. About 300,000 civilians were trapped on a narrow beach during the onslaught and a UN panel has estimated that 40,000 non-combatants died. Both sides committed atrocities, but army shelling killed most victims, it concluded. Since the end of the war, harassment of government critics, including attacks on journalists and human rights workers have continued. A heavy army presence in the former Tamil Tiger strongholds in the north of the country angers some local ethnic Tamils who feel they are treated as enemies of the state. On Sunday, Channel 4 News said it had obtained new evidence which it, and Tamil campaigners, have said demonstrated that an underlying culture of systematic brutality and sexual violence existed within the ranks of the Sri Lankan military. The footage, which was reported to have been filmed by a soldier on a mobile phone, was said to show troops laughing and cheering as they celebrated the deaths of Tamil insurgents and performing acts of grotesque sexual violation on the bodies. The channel has continued to report on what it said was evidence, in the form of various pieces of footage, of the apparently systematic execution and sexual violation of prisoners. The Sri Lankan government has claimed that the footage is, variously, doctored, manipulated or acted by Tamil insurgents dressed as government soldiers and speaking Sinhala, the language of the vast majority of government soldiers. The photo shows a spirited response by true Sinhala Buddhist Sri Lankan citizens domiciled in white man’s United Kingdom to the meddlesome Cameron Government’ s interference in the soveriegnity of our mother land. Good work guys, keep it up. you will be blessed with Nibbana one day. even we are not bothering about the war crime but raising discrimination will be a hard spot. I have been visited to lot of Asin & African countries reasently. what I see is more than 90% of the people in each and every country dont like the interfearance of other Nations, specialy the WEST to there admin. They Ignor them. The problem is the WEST is working according to their ajanda and they dont crae whay ever happends to the 3rd World countries. It says there is a big gap with the World politics and the actual people live in this earth. You are entitled to your opinion Jayantha, but I beg to differ. The peoples of the world are sponsoring many NGO’s with their own money (not Government money) to independently research social issues in the whole world and report on them. This helps Western Governments to develop apprprite policies. Amnesty International is one of these NGOs. The UN has lost its stature because of extremely poor leadership provided by the current SG. The UNHRC is doing ver well because it has excellent guidance under Ms. Pillay. Louise Arbour set the trend in the UNHRC and Navi has established a definitive role for the body. Ms. Pillay is moving on in Augst; she will definitely have a role in International Issues for a long while just as Ms Arbour who is head of the Crisis Group. Two Australian polticians who were voted out of office recently are tipped to be the UNSG and UNHRC Commissioner. As an international citizen, I hope this does not happen because the Australians are a dumb lot, incapable of leading international bodies leave alone themselves. At the end of the war, SL made a promise to the World (to the UNSG and 13A). The day this promise is kept, it will regain its international stature.